New Jersey family courts emphasize the importance of maintaining regular contact between parents and children and will not impose conditions that would interfere with visitation unless there is evidence that they are necessary for the child’s well-being. In a recently-issued decision from the New Jersey Appellate Division, the judges considered whether to impose conditions on a son being allowed to visit with his father, per the mother’s request. The court ultimately declined to force a father and son to undergo what the mother had labeled “reunification therapy” as a condition of the father being allowed to have physical visitation time with his son. The parents in the case of Lanzana v. Duplan had been in a nine-year relationship which resulted in one son. The father was a French citizen who had long lived in the US but who would regularly visit France with his partner and child to see his family. The parents split up in 2013 and entered an agreement stating that the father could take his son on international trips, provided he gave 20 days’ notice to the mother and provided a detailed itinerary. After the split, the father quit his job and relocated to the French Polynesian island of Bora Bora. The father and son had maintained contact through Skype calls. After the father established a website that published harassing content directed at the mother, the mother obtained a restraining order which temporarily prohibited contact between the father and child. 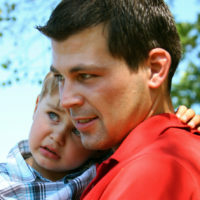 The court that granted the restraining order set out terms that the father would need to meet before being allowed to have physical visitation with his son. Once the father had met those terms, he requested that the son be allowed to travel with his father to visit his paternal grandparents for Christmas, and spend his summer vacation with his father in Bora Bora. The mother responded by stating that the father and son should not be permitted to have physical visitation until they had undergone a period of reunification therapy. The mother noted that the father had not communicated regularly with their son, though the father argued that the mother had interfered with this communication. She argued that sending the son to a foreign country without his mother would be traumatic, and that she did not trust that the father would return their son to the US. The mother had also argued that the father’s treated depression was an additional cause for requiring therapy before allowing physical visitation between the father and son. The Appellate Division ruled that the parent requesting the imposition of court-ordered therapy would need to show that the other parent/child relationship was estranged in such a way that a specific type of therapy was necessary before a court should order it. Here, the mother had not offered any evidence of behavior by her son that showed his fear of being alone with his father, nor any other evidence of emotional trauma the son experienced surrounding his relationship with his father. In fact, the father presented evidence that his son had repeatedly expressed interest in seeing his father and visiting him where he currently lived. The trial court had ordered that the father and son undergo therapy prior to any visitation, but the Appellate Division reversed this decision. The Appellate Division concluded that a two-year physical separation was not, in and of itself, a good reason to require the father and son to attend reunification therapy. The opinion noted that, without some evidence that the son had refused to see his father, that he was angry at his father, or that spending time with his dad could cause him to suffer “emotional or psychological harm,” there was no basis for “imposing this hurdle” before allowing the visit. The court also held that there was no reason that the father’s treated depression should result in mandatory reunification therapy. The Appellate Division’s opinion also noted that the son had expressed interest in seeing his father and paternal grandparents, and that while this preference shouldn’t be the only fact a court considers, it “should not have been dismissed out of hand” by the trial court. The Appellate Division pointed out that the trial court should have interviewed the child before ruling that reunification therapy was needed. The opinion also noted that the son had on numerous previous occasions visited his grandparents in France, making it a familiar environment for him. The Appellate Division ordered that the parents create a visitation schedule between the father and son. If you’re facing a family law issue in New Jersey, seek skilled and dedicated legal help by contacting the Union custody and divorce attorney John B. D’Alessandro for a consultation, at 908-964-0102.